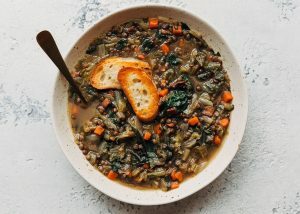 Made with Le Puy lentils, red wine, leeks and escarole, this French Lentil Soup is a hearty, warm, and comforting recipe that only takes a little over an hour from prep to table. Some days (many days, actually), I crave a comforting bowl of soup. It isn’t only a cold weather thing with me, either; I’ll eat some iteration of soup on the chilliest winter days and the most sweltering summer nights. 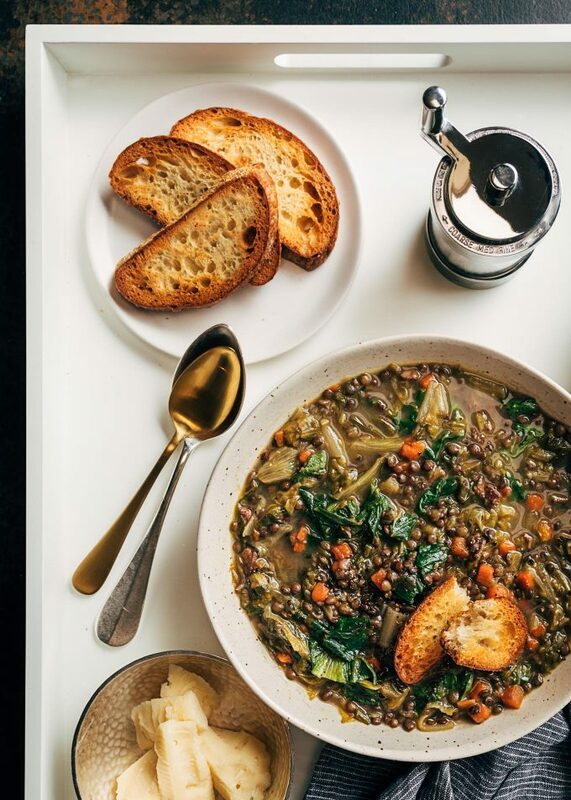 French Lentil Soup is something I make at least a couple of times a month, particularly during the fall and winter. It’s a soup I turn to when I want something that’s healthy and satisfying, without a big time commitment. 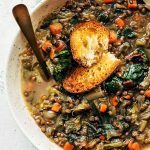 In this lentil soup recipe, I combine nutrient-packed Le Puy lentils with a touch of bacon; steamy, soothing stock; sautéed vegetables, and fragrant thyme. 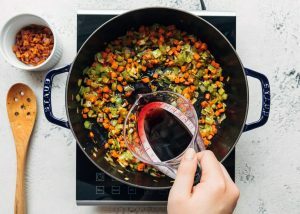 A little bit of red wine gives the soup depth, and ribbons of tender escarole finish the dish with added color and texture. This is a hearty, brothy soup you’re going to want to dive into with a crusty loaf of bread on a cold night. If I had to choose a favorite type of lentil, it would be French “Le Puy”. These tiny, dark green-marbled lentils have an earthy, nutty flavor that I love. 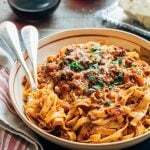 They also have a slightly thicker skin and less starch than other lentil varieties, so they hold their shape when cooked. 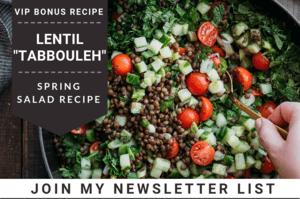 I like to use Lentilles du Puy in warm lentil salad (Lentil and Goat Cheese Salad with Walnuts from David Lebovitz’s My Paris Kitchen is a favorite) and hearty, broth-based French lentil soup. Lentilles du Puy are a type of lentil that have been cultivated in the Auvergne region of France; specifically, Le Puy-en-Velay for more than 2000 years. 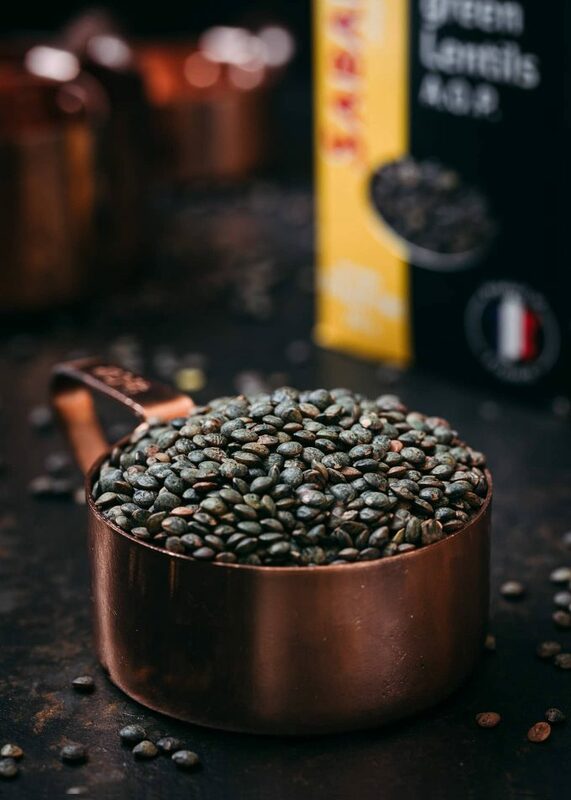 The climate and volcanic soil that Le Puy lentils are grown in are central to their characteristic texture and flavor. 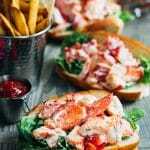 As such, the variety has been granted “protected designation of origin” in the European Union and AOC/AOP statuses in France. These designations set quality standards and protect the integrity of regional products from imitations. You’ll often see them applied to imported cheeses and wine. When shopping for Lentilles du Puy, look for an AOC or AOP stamp on the box to ensure that you’re buying the authentic product from Auvergne. Like all lentils, Le Puy should be sifted through to remove any small stones that might’ve gotten into the harvest, and rinsed. I can count on one hand the number of times I’ve actually found a pebble in my lentils, but I still check every time. I like to spread the lentils out on a cookie sheet and quickly sort through them. You do not need soak lentils before cooking. 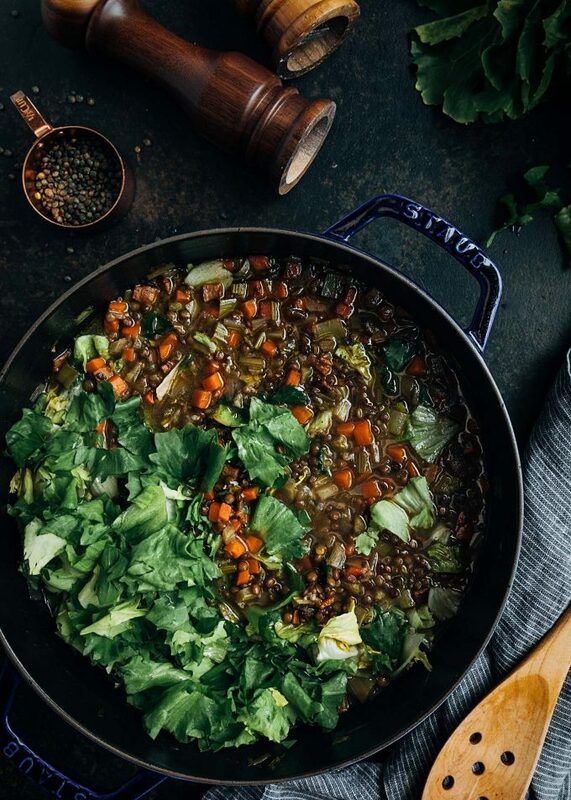 Whether you’re simmering them in water or broth to make a salad, or adding them to a soup, Le Puy lentils will take anywhere from 25-45 minutes to cook. It depends on how firm you want them to be for the type of dish you’re making. For French Lentil Soup, I cook the lentils for 40-45 minutes so that they’ll have very tender, creamy interiors. 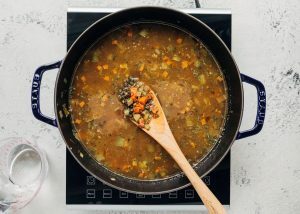 Le Puy lentils will not become mushy when cooked for this long, and will still look like lentils when the soup is served. Want to brush up on lentil varieties? Check out All the Types of Lentils from Bon Appetit’s Basically. Escarole is a leafy green vegetable in the chicory family. 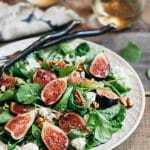 With a mildly-bitter flavor that mellows and sweetens further upon cooking, it isn’t as piquant as its cousins, endive and radicchio. Escarole is very versatile and can be served raw in a salad; braised, wilted, or stewed; or added to soups. Read: 3 Reasons to Drop That Lettuce and Meet Escarole from The Kitchn. As with most leafy greens, you have to make sure that you wash escarole well. You’ll often find grit hiding between the layers. I approach prepping it much the way I would a leek; swishing and soaking it in a bowl of water, with a few thorough rinses, to ensure that all of the dirt is removed. 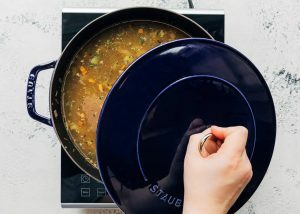 When making French Lentil Soup, I trim off the root end from the head, and tear or chop the leaves into bite-sized pieces. Like cooking with spinach, it will appear that you’re adding a ton of greens to the pot. As you stir the escarole into the soup, it will cook down and reduce drastically in volume. This soup is a perfect choice for when you don’t have hours to let a recipe cook. All you need to do is sauté the bacon (omit for vegetarian) and vegetables, add the liquids, and simmer with an occasional stir. The entire dish comes together about an hour and a quarter. Even less, if you prep your veggies ahead of time. 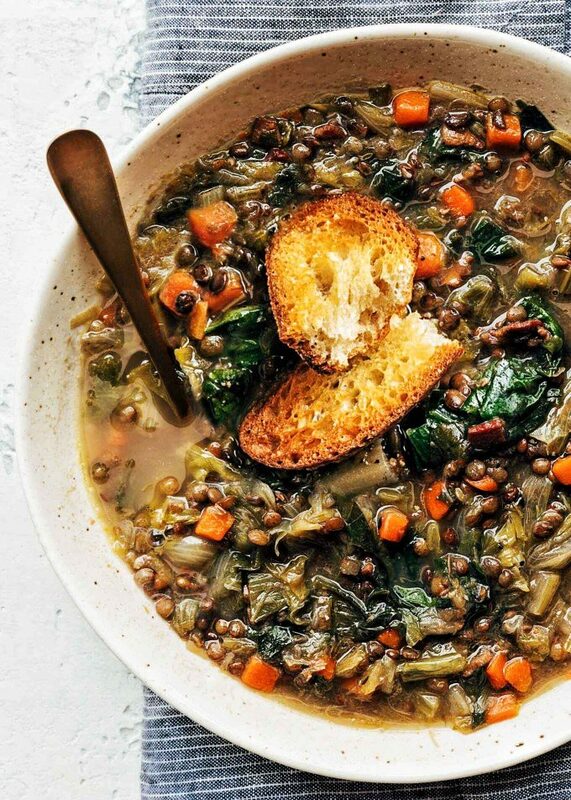 I like to serve French Lentil Soup with a drizzle of extra virgin olive oil and freshly-cracked black pepper. I’ll also often nosh on a few pieces of aged cheese on the side, such as Gruyère. Torn pieces of artisan bread are perfect for dipping into the broth. Or, even better, a few of my Buttery Garlic Croutons. 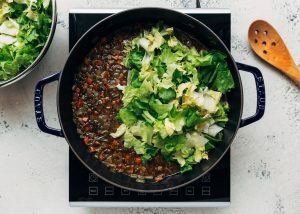 This lentil soup, with smoky bacon, Le Puy lentils, red wine, and escarole is a hearty bowl that's perfect for a chilly day. 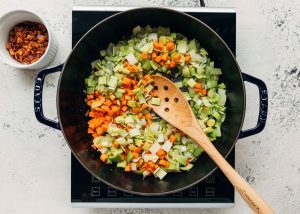 To make the soup vegetarian, omit the bacon, sauté the vegetables in 2 tablespoons of olive oil, and use vegetable stock. In a large, heavy bottomed pot or Dutch oven, cook bacon in olive oil until crisp. Remove bacon from pan with a slotted spoon and set aside. Add carrots, leeks, and celery to the pot with 1/2 teaspoon each kosher salt and pepper. Sauté over medium-high heat until vegetables are softened and beginning to brown. Add garlic, and cook for 1 minute, until fragrant. 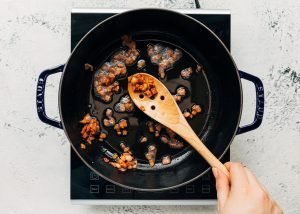 Deglaze the pan with red wine and cook for 1-2 minutes, scraping any browned bits from the bottom of the pot. Stir in lentils, followed by stock, water, thyme, bay leaf, reserved bacon, and an additional 1/2 teaspoon salt. Bring to a boil, reduce heat, and simmer, partially covered for 25 minutes. Stir occasionally. Add escarole to the pot and stir it into the soup (it will look like a ton of escarole; it will wilt down as you stir the soup). Bring the soup back to a boil, partially cover the pot, reduce heat, and simmer for 15-20 minutes, until lentils and escarole are soft. Remove bay leaf. Season soup to taste with salt and pepper. Serve with a drizzle of extra-virgin olive oil, freshly-cracked black pepper, and garlic croutons, if desired. I like a prominent amount of escarole in my lentil soup (similar to how I'd make Escarole and Beans), so I use a full pound. (1 full medium to large head.) If you prefer less escarole in your soup, use 1/2 pound, or 1/2 of a head. For soups, I like to trim off the white root end and use the dark and light green-yellow parts of the escarole leaves. This sounds just wonderful and looks sooo comforting and warm. 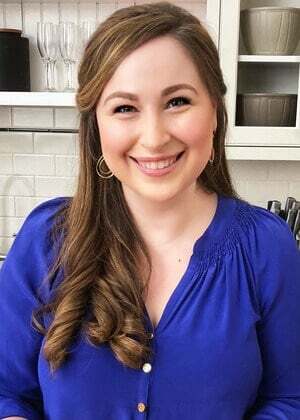 And I just love how you write, Amanda – “ribbons of tender escarole” – it’s seriously poetry to me. 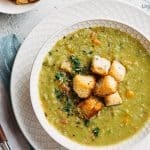 This is such a stunning soup, I’m going to give it a try soon! I can’t get over how good this looks! I love a good French lentil soup and it’s been so long since I’ve made one. Love your take on it! This is the perfect soup to make on a cold day when all you want is comfort. 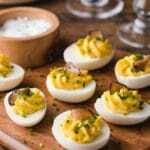 Great recipe development and photos, the colors are beautiful ! I have never cooked with French Lentils, and I didn’t realize that these legumes had been “branded” like champagne and burgundy. I love lentil soup, and I really want to make this. Do you think it would work with brown lentils if I can’t find the Le Puy Lentils at my local store? Hi Patti. Yes, you can substitute brown lentils. 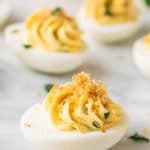 They will not need as long a cooking time (generally 30 minutes) and the texture will be a bit softer. I’d add in the escarole after about 10 minutes of cooking. If you can’t find branded Puy lentils, I’d look for “French Green Lentils” first, as they will be closer in texture and flavor to Puy. Check the natural section; I know Bob’s Red Mill grows them. I love lentil soup and just made a batch the other day, BUT I can’t wait to make your recipe. 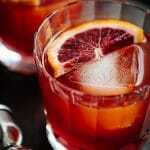 I love to see the variations and how they taste!! 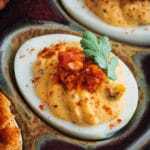 Your photos are simply gorgeous and your recipe is delightful! OMG this soup is just drop dead gorgeous. 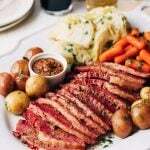 It looks so rustic and cozy and I need a big bowl of this now! Aren’t Puy Lentils just the best? 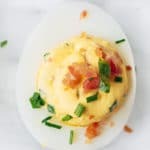 Paired with the smokiness of that bacon – just perfect! I could do with a big bowl of this gorgeous soup right away! Why is lunch still so far away?? Holy smokes. This soup is everything that I want and need in my life right now. I absolutely love lentils. Trying this ASAP.